Summer is coming to a close and we are starting to see some shifts– in the season and even a shift in the kinds of activities the Treasure Valley has to offer. While the events of July and August were great, they are nothing compared to the events we have going on in Boise during the month of September. This month is going to be full of great fun, excitement, and a lot of unforgettable memories. There are few things that compare to watching a hot air balloon take to the sky and gently glide above the city, and the awesome part is, here in Boise we get 5 whole days of it! During the end of August and the beginning of September is when the annual Spirit of Boise Balloon Classic (a hot air balloon festival) is held. It is a time for hot air balloon pilots, enthusiasts, and spectators to gather and watch these majestic creations lift off into the cool morning air. It is a great time, even for those who do not go down to the launch ceremony as everyone in the valley can see these tens of hot air balloons floating above downtown. Bronco football is one of the most popular late summer and fall activity in the Treasure Valley. During September, football fans of all types gather round a television, trek to the blue field of the Albertson’s stadium, or even hop on a plane to follow the team to away games, just to get another dose of Bronco Football. The first home game of the season is against our neighbors to the north: the Washington State Cougars. They will come down and play the broncos on the night of the 10th. You can watch this game on ESPN, but if you want the real experience you have to head down to watch the game at Albertson’s Stadium— there is nothing like it. If you are a fan of 90s, 2000’s or 2010’s punk rock, then this is a concert you need to check out. The famous band Blink-182 is coming to the Taco Bell Arena this month to give the City of Trees a concert it will never forget. To celebrate their newest album (California) Blink-182 is going on tour through the US and Canada bringing their pop and punk music to life once again. You can get tickets to this great show through the Taco Bell Arena website. Tickets range from $25 to $75 for varying seating choices (the $75 choice is for general admission, however it is the closest to the stage). Boise is a wonderful place to live and there are few of its neighborhoods that are as eclectic and attractive as the North End. In the North End, there is Hyde Park, one of the most prominent streets in the whole city. Every year, Hyde Park holds a street fair to celebrate the community and have a good time. This year’s street fair will be held on the 16th through the 18th of September. Check out the North End website for more details. Considered one of the best rock bands of all-time, Def Leppard is a band that easily creates quite the hype. Their upcoming Boise concert is looking like it will be an event that everyone will want to attend. This legendary rock band is performing at the Taco Bell Arena on the 28th. Tickets are scarce, but you can find them on the Taco Bell Arena website. They are a bit more expensive than the ones you would get for a concert like Blink-182, but they are totally worth it to the passionate fan. Boise, and the rest of the Treasure Valley, is such a wonderful place. Whether you are looking for great events, a serene place to live, or just to have fun, then you are definitely on the right track. Now, these aren’t the only things that our little corner of Idaho has to offer during September. There are many more awesome things to do here, so be sure to keep your eyes peeled. If you are looking for fun things there are to do in the Boise area this July, then you will not be disappointed, and if you thought that nothing could top June’s activities, then you are going to really love what the Treasure Valley has to offer this month! July is all about summer fun, and while there are many events out there that are diverse, there are many musical activities to get excited about this month. However, before we delve into the rock and roll and contemporary concerts we have to look forward to, let’s take a second to check out . . .
Nampa Idaho is home to many great things, and one of them is its large variety of community activities there are. The Craft Corner is kind of like a fair for arts and crafts. Many people from around the area will being their wares together to sell, trade, and market their crafts and craft services. It is great for the crafty person in all of us. For more information about the Craft Corner, click the link at the beginning of this section, or call their number at (208) 890-6909. Doors open at 6:30 for this amazing show. Like we said earlier, July is the month for music, and the band KISS will kick it all off on July 7th. This concert will be one to remember as Gene Simons, Paul Stanley, and the rest of the KISS band rock Boise to its core. Tickets for this great show range from around $40 to $125 each depending on your seat. But you better order them now before they are all gone. This is a long expected event that is going to draw many spectators. If you like the stage, then you will love the Stage Coach Theater. It is a great way to enjoy good quality entertainment right here in the heart of Boise. This thrilling play will be put on by the Stage Coach Theater several times this month on different days. So, be sure to check out their website for more information on the exact days that it will be performed. Next on our list of great musical performances is the great Phillip Phillips. The American Idol winner will be performing at the Idaho Botanical Gardens amongst the Garden’s fabulous vegetation. It will be a night to remember as both Phillip Phillips and Matt Nathanson perform some of their greatest hits here in the City of Trees. Tickets for this show are different depending on if you are a Botanical Gardens Member or not. Member’s tickets cost $37.50 and the general admission tickets are $42.50. Also on the 14th of July, Meghan Trainor will be performing on stage at the Ford Idaho Center in Nampa. So, if you are “all about that bass”, then you are going to love this opportunity. Meghan Trainor’s “The Untouchable Tour” will be stopping here between concerts in places like Rosemont, Illinois; Seattle, Washington; and San Jose, California. This will be a great concert for all music fans, and tickets are priced very affordably as well. The Idaho Center tickets range from $30 to $50 (plus ticketing fees) and doors open at 6:00 PM that Thursday. But be sure to buy your tickets now, the price will increase $5 for each ticket on the day of the performance. July 14th is a great day for events in the Treasure Valley, so, no matter what you want to do, you are going to find something you like. This event, unlike the Meghan Trainor and Phillip Phillips’ concerts, is free to the public. For more information about the movies they will be showing all summer, click the link at the head of this section to check out the Facebook page! Spring is coming to a close and the first warm days of summer are starting to creep up on us here in the Treasure Valley which, for Boiseans, is a sign for many fun things to come. After the many outdoor activities that the Boise area has to offer, there are also these, and many other, great events in the area for you to enjoy. So, if you are looking for some fun ways to spend the first few weeks of summer, then start off with these great events happening right here in the City of Trees! Are you a fan of fine arts? Do you like experiencing the great beauties of many cultures? What about getting great décor for your home or office from local artists? If you said yes to any of those questions, then you are going to love the Art and Roses event on the 5th of June. The event starts at 10:00 AM and goes until 6:00 PM at Julia Davis Park near the Art Museum and admission is free! There will be over 50 different artists from Southwest Idaho selling all sorts of things from sculptures to paintings and everything else you can imagine. However, if you get hungry, or want to take a break from shopping, you can get yourself a bite to eat at one of the many food vendors and sit down to watch some of the musical entertainment that will be playing throughout the day. Paint the Town is an annual event put on by the NeighborWorks program here in Boise. It is a volunteer program that paints the houses of people in the community that are in need. How they select the persons’ homes they will work on isn’t exactly clear, but what is clear is that this community program is a massive scale service project that not only helps out those in need, but brings the community closer together. The houses that are to be painted are divided up and given to groups of volunteers; groups that you can create yourself by gather friends, neighbors, coworkers and so forth, which is a great team building exercise and volunteer opportunity. However, if you don’t want to gather your own group, you can get to know some other people in the community by joining a group that is already formed. If you are a fan of educational programming, astronomy, or just gazing up on the night sky, then you are going to want to be at Neil deGrasse Tyson’s show coming to the Morrison Center this month. Mr. Tyson is famous for his educational shows on astronomy, astrophysics, and the wide world of science and we are lucky enough to have him here in Boise on his 2016 tour. Buy your tickets now so you won’t miss the great and inspiring words of Neil degrasse Tyson as he shares his knowledge of the universe through enlightening narratives and riveting explanations. Tickets range from $85 to $250. “Take me out the ball game!” is the saying, and if you too are saying that this summer, then you won’t want to miss the Boise Hawk’s first home game of the season! Watch them take on the Salem-Keizer Volcanoes from Oregon in this long awaited game. Enjoy a night at the ball park with food, great entertainment, and much more. Easily one of the most long awaited concerts of the year, the Boise Music Festival is an all-day event that gives you the best of today’s music. This year the lineup includes great musicians like Coolio, Andy Grammer, Nelly, and Daughtry— not to mention a lot of local bands! The Boise Music Festival will be held at Expo Idaho on Chinden across from Fred Meyer. It is a fantastic event that is sure to knock your socks off. Be sure to stay hydrated and get there early for good parking! Tickets can be bought via the Boise Music Festival website. Fans of reggae, folk, and or rock music should take note of this concert! Ben Harper and the Innocent Criminals are coming to Garden City this June on their United States and Canada tour. They will be playing at the Revolution Concert House on Chinden starting at 7:30. It is a great concert that will certainly make your summer with their inspiring and tasteful music. Don’t miss out on this opportunity. Get your tickets now by visiting ticketfly.com’s website by clicking here. For more information about all the great things that are happening in Boise and the Treasure Valley, keep checking back on this page! We’ll keep you up-to-date on all the awesome activities and events this great city has to offer! Harlem Globetrotters in Boise, ID – Tonight! “85 years ago in Chicago, a 24-year-old businessman named Abe Saperstein formed a small basketball team called the Savoy Big Five. He was just trying to promote a nightclub called the Savoy Ballroom, but in just a few years the team had played over 1000 games around the country and become the Harlem Globetrotters. In 1941, just before the start of World War II, the Globetrotters signed Reece “Goose” Tatum, an all-time great who developed amazing comedy moves and changed the direction of the team. By the end of the war the Globetrotters had played an incredible 30,000 games (losing only 2190) and were featured on the cover of Life magazine. Those were remarkable achievements at a time when America was deeply segregated by race. The team toured the world, breaking cultural and social barriers along with basketball records. They were the first team to play basketball in Europe. In 1950, a Globetrotter named Nathaniel “Sweetwater” Clifton became the first African-American player to be drafted by the NBA. In 1959, when the United States and the Soviet Union were enemies at the height of the Cold War, the Globetrotters went on a sold-out tour of Russia. Over the next 50 years, tens of thousands of people around the world turned out for each of the Globetrotters games, including presidents, kings, and popes. Their line-up has included some of the greatest players ever, including Wilt Chamberlain and Magic Johnson, and they’ve been inducted into the Naismith Memorial Basketball Hall of Fame. The Globetrotters have appeared in their own movies and TV shows and have been seen by hundreds of millions of people in 120 countries. The Harlem Globetrotters are simply the most famous basketball team in the world”. ‘The Herdmans are the worst kids in the history of the world. They lie, steal, swear, and hit little kids. So no one is prepared when this family invades church one Sunday and decides to take over the annual Christmas pageant. The Herdmans have never heard the Christmas story before. Their interpretation of the tale has a lot of people up in arms. But it will make this year’s pageant the most unusual anyone has seen and, just possibly, the best one ever’. It is based on a book. The Herdman children tell the story of Christmas even though some of them have rarely, if ever been to church. It is a great humorous read with some life lessons thrown in too. Tomorrow is Veterans Day, an ‘official’ day to thank and honor all who have served in the United States Armed Forces. The Veterans Day National Ceremony will be held at 11:00 (Eastern Time – 9:00 Mountain Time) in Arlington National Cemetery in Arlington Virginia. It begins with wreath laying at the Tomb of the Unknowns and continues inside the Memorial Amphitheatre with a parade of colors by veteran organizations and comments by dignitaries. I could not find where we have local coverage, but CNN usually has good coverage on this event. You can also try CNN online: http://www.cnn.com/. 11:00 a.m. Boise State University Veterans Day program. Features a reading of names of Idahoans who have died in service to their county in Iraq and Afghanistan over the past decade. South end zone of Bronco Stadium. A reception and dedication of Boise States new Veterans Services Center will be immediately after the ceremony at the Alumini Center: 1173 University Drive across from Bronco Stadium. 1:30 Boise Rescue Mission hosts a ceremony for veterans at the new VFW post at 8931 W Ardene Street (Overland and Maple Grove). The mission staff will give away more than 50 backpacks with winter gear to homeless vets who attend the ceremony. 11:00 a.m. American Legion Post No. 26 will lead Veteran’s Day ceremonies at Mountain View Cemetery in Mountain Home honoring all veterans and active duty military. The event will feature guest speakers and a presentation of wreaths honoring veterans. Col. Ronald Buckley, 366th Fighter Wing commander, is expected to be the featured speaker at the event. To all of our veterans and active military service men and women, thank you for protecting our freedom. Thanks to my friend Patty, I recently discovered another gem in downtown Boise, Pho Nouveau. This restaurant is on Idaho Street between 8th street and Capital. Very delicious Vietnamese comfort food. 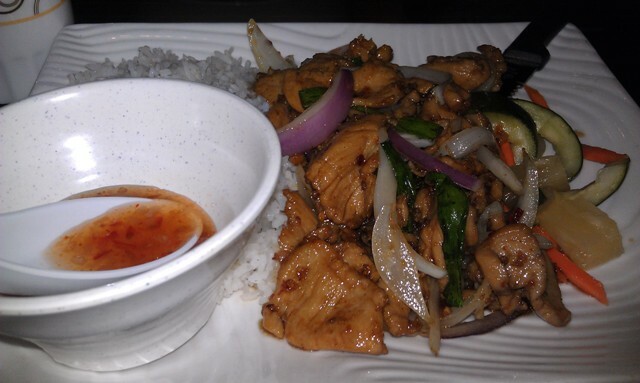 I had the Lemon Grass Chicken: boneless chicken breast marinated in lemon grass, white wine, oyster sauce and garlic. Oh my, it was delicious! The Pho Bowls are excellent too as well as the Fresh Summer Rolls. I look forward to trying several of the other items on the menu like: Chicken Curry, Hot and Spicy Beef and the Summer Noodle Bowls. November and December boast a lot of downtown Boise events. If you are looking for a delicious refuel spot, this would be a spot to check out.